As Additive Manufacturing, aka 3D Printing, gains momentum in various industries, experts predict there will be a shortage of trained workers. According to the Society of Manufacturing Engineers, 9 out of 10 manufacturers are struggling to find the required skilled workers for 3D technologies and other manufacturing skills. Dr. Ismail Fidan from Tennessee Technological University wants to bridge the 3D printing knowledge gap before it starts with a new “train the trainer” workshop called the Additive Manufacturing Studio aimed at STEM educators. The workshop is part of the National Science Foundation’s Additive Manufacturing Workforce Advancement Training Coalition and Hub (AM-WATCH). It is funded by a grant that brings together the Technician Education in Additive Manufacturing & Materials (TEAMM) housed at Edmonds Community College, Tennessee Tech University, and Sinclair Community College. In July, 15 educators in Washington State attended a workshop at Edmonds CC’s Materials Science lab in Monroe Hall. Most of them were from community or technical colleges, but four high school teachers participated as well. They learned how to build and use 3D printers. Members of each institution will work together to develop curriculum and educational materials, professional development activities, outreach targeting K-12 teachers and students, and other efforts. TEAMM is housed at Edmonds CC and funded by the NSF Advanced Technological Education directorate. According to Mel Cossette, TEAMM’s executive director and principal investigator, 3D printing is an emerging technology that will eventually be used in every sector of manufacturing industry, from aerospace to medical. 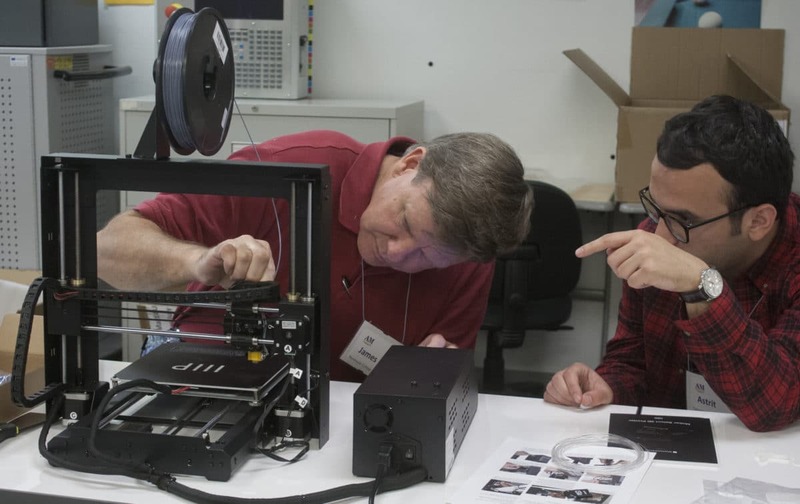 In addition to the workshop training at Monroe Hall, attendees were able to go on a factory tour of the Fathom 3D Printing Studio in Seattle. Learn more about Summer 2018 workshops by emailing Robin Ballard at robin.ballard@edcc.edu. Or you can keep tabs on the TTU AM-WATCH website.